It’s getting harder and harder for a band to come off as authentically unique, but still a mighty few persevere. 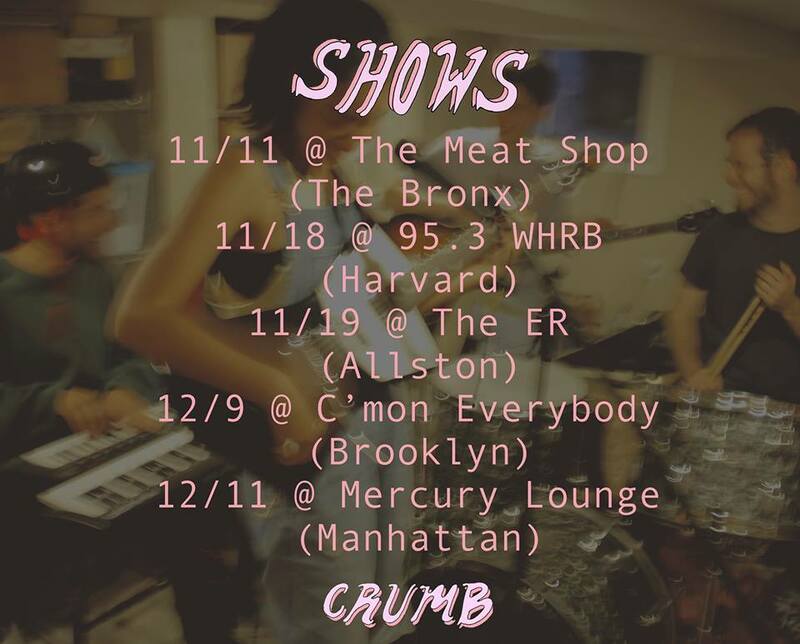 New York/Boston-based Crumb is one of those special bands. Independently released on 8/30/2016, their debut EP Crumb is an enchanting haze of experimental music that combines jazz, rock, psychedelic, R&B and soul influences – among others. Littered with calculated instrumental bursts and dreamy chord sequences, Crumb defies the boundaries of traditional genre and songwriting as the band opts for uncharted territory in their exploration of the sonic landscape. A freshly captivating (and appropriately-titled) three-song set, Crumb will keep you wanting more and wondering which of the many musical directions this young band will go in next. 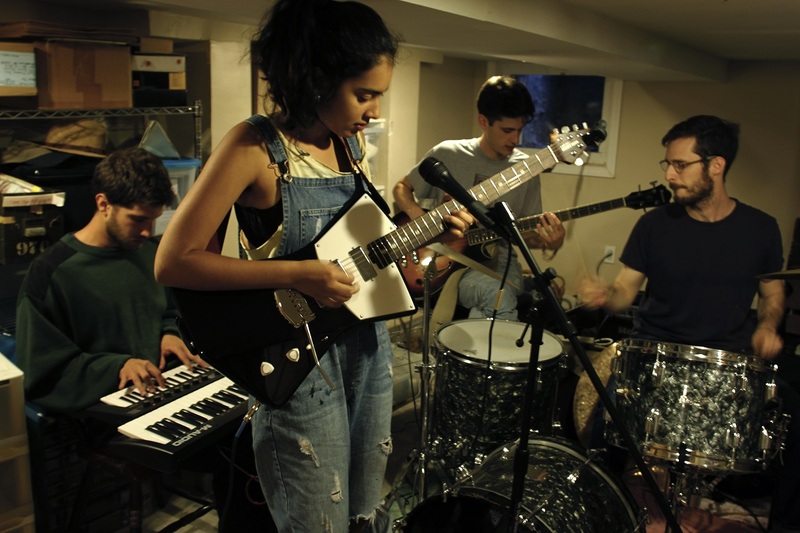 Lila Ramani (guitar+vocals), Jesse Brotter (bass), Brian Aronow (keys+saxophone), and Jonathan Gilad (drums) met at Tufts University, collaborating in various musical ensembles before forming Crumb together. Such a history makes sense – they are perfectly in sync with each other at every step along the way, twisting and turning through seemingly complex moments with a laid-back ease. it’s evident that despite the song’s dreamy feel, she’s on familiar terrain. She knows exactly which words to emphasize and draw out to keep the song’s flow – well enough so that the sweet saxophone that comes in later on the track feels like it was exactly what you were waiting for all along. There’s a natural ebb and flow to Ramani’s words in “Vinta.” Maybe it’s the mention of cold winter winds, “impending doom,” and a “deep blue past,” but whatever the reason, “Vinta” conjures up images of a beach in winter, a sort of seasonal barrenness where things don’t seem to move forward. Everyone in the song seems to be in their own private sort of rut, mirroring the season the song is set in. A distinct haze, a musical blur of sorts, engulfs the song in a surreal cloud. This cloud does not last, however, Crumb shake things up halfway through the song with a guitar-led instrumental explosion. The rock-tinged interlude unlocks a hidden energy, changing the song’s entire feel. Each instrument has a slight solo – a feature also common to jazz that works incredibly well on this track. Whether it’s consciously intended as a direct break from the theme of winter stagnancy or not, the cycling through each instrument definitely gives “Vinta” an edge. Its cacophonous ending is a defiant wake-up to the first half’s chilly doldrums. Rounding out the EP is “So Tired,” which shows Crumb traversing into more of a dream-pop realm. Brotter’s steady bass lulls the listener, creating a dreamlike atmosphere furthered by Ramani’s patient, hypnotic vocals. She sings slowly, apply subtle pressure to her words as needed, like she has all the time in the world to get it just right. By speeding up and decreasing the tempo, Crumb keep listeners’ attention fully on their music – specifically, how each different sound works together to fully realize a dreamlike atmosphere, something that hearkens back to other jazz influences seen throughout the EP. 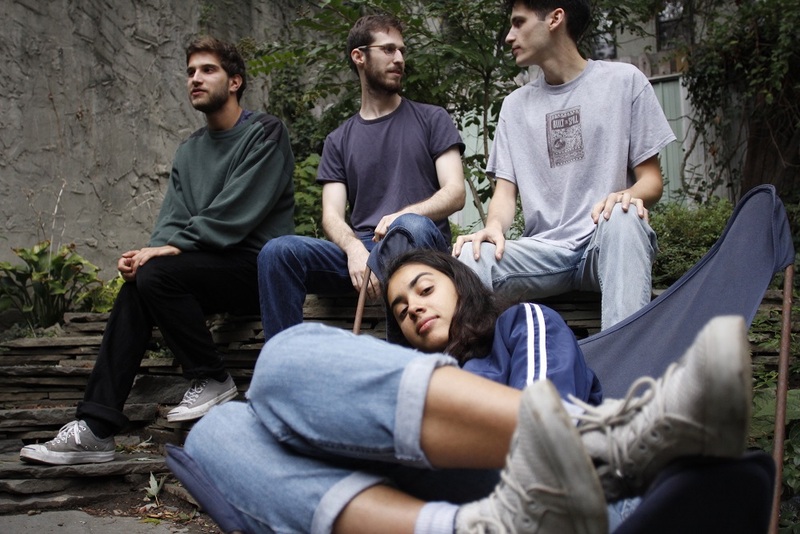 Crumb consider themselves to be a mix of “psychedelic soul” and “bedroom rock,” according to Brotter – yet one of the best aspects of their music is its inability to be defined by any singular thing; they’re all over the place in the best way possible. Ramani, who grew up in Brooklyn near the heavily-polluted Gowanus Canal, told Sound of Boston she hopes “some of that griminess creeps into the music.” Crumb‘s album artwork is an abstraction of the canal as well, and indeed a sonically dense fog of sorts does radiate throughout the record. Crumb’s Crumb is as much a finished product as it is the start of something new and special. It may be bite-sized, but those twelve minutes pack a serious punch. Ramani, Brotter, Aronow and Gilad have just begun their foray into the recorded and live music world, and their first offering is a promising indicator of what may come, as well as a standalone display of thoughtful, organic outside-the-box musical talent. Relaxed, hazy, polished and mesmerizing, Crumb will fill your ears with delight. Consider coming out to one of the band’s shows in New York or Boston over the next few months, and stay tuned for more from this artist to watch in 2017!